A quick post to share a super cute Giveaway!!!! Please hop over to POD blog for your chance to win!!! I have a very Happy News to share with you all!!! I'm super excited to be a part of Purple Onion Designs Holiday DT!!!! Loooooooove their super cute stamps...great variety of designs. Can't wait to share my POD creations with you!!! Check out the list of lovely crafters joining me for this Holiday DT ...HERE. 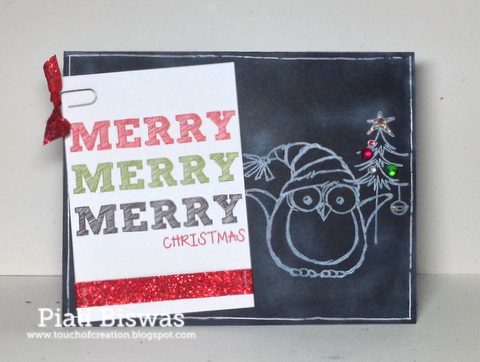 Now its time to share my Chalkboard creations with you..
First up is a fun birthday card.. I used THIS Avery Elle stamp set designed by Nina. 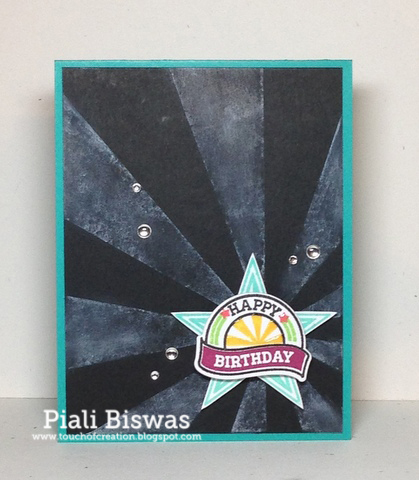 I made chalkboard background with Hero Arts sunburst stamp. 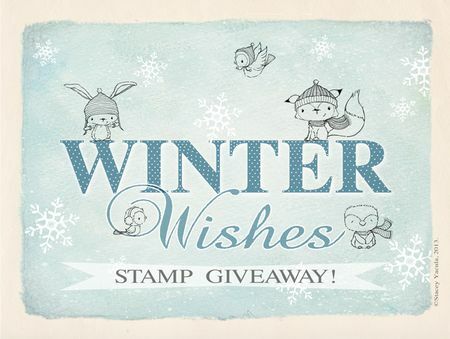 Looooove this cute owl holiday stamp from Stampendous!!! Got it from Michael's few weeks ago. 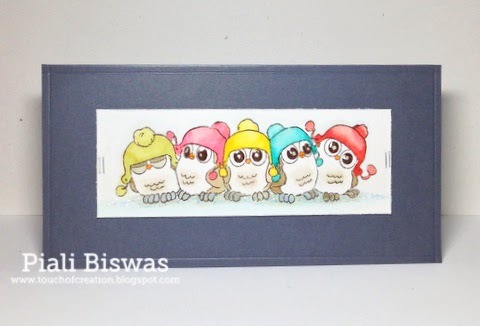 Sentiment panel is print card from Bazzill Christmas collection. Stamping Sensations : All creatures great and small. 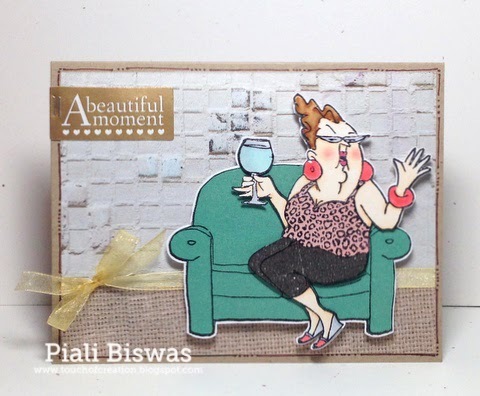 Created With Love Challenges: Anything Goes. Hope you all are enjoying the weekend!! 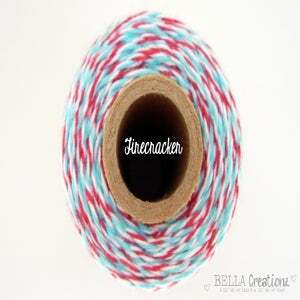 Firecracker Timeless twine is so pretty...love the color combo so designed a card with combo. 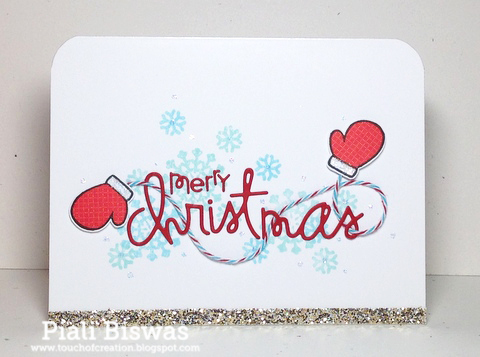 The cute mitten stamp and the lovely holiday sentiment die is from Paper Smooches. I paper pieced the mittens using some Doodlebug Christmas papers.I created the snowflake background with the snowflake images from the same PS-Merry Motifs set & Hero Arts Soft pool ink. Aud Sentiments Challenge: Christmas Sentiments. 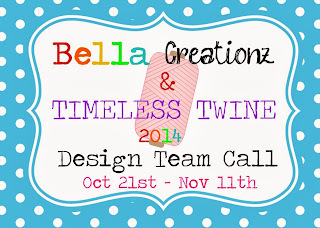 Timeless Twine is having a DT call now....check HERE for the details. I love the Timeless Twine DT...its one the most fun place to be, Stacy is super fun to work with and none the less Twines are the most amazing thing to create with. Hello & Happy Hump day!!! Now its NEON time, I used few of my favorite Hero Arts neon inks...Green and pink. First up is simple holiday card using Simon Says stamp stencil and Hero Arts sentiment stamp..
Background was super easy to create...just sponged the inks on the stencil, did one color and shifted the stencil a bit for the other color. For the sentiment...I heat embossed it with detailed white EP but before using the heat gun , I sprinkled some Martha Stewart fine glitter also...like the sparkle a lot!! This card can be easily mass produced..and its pretty flat for mail too. I ♥♥♥ THIS snowflake stencil from Simon Says Stamp!!!! The tree border stamp is from Hero Arts, also the sentiment. I used some Watermelon Sorbet Timeless Twine. Another super easy holiday card!!! 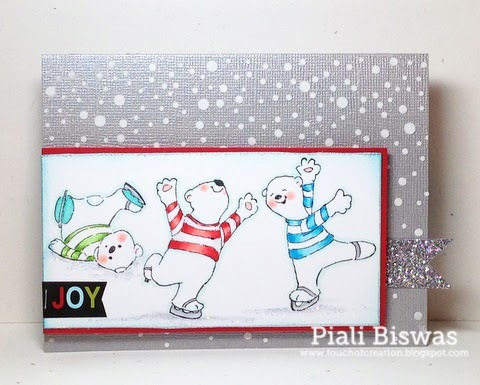 These two cards are for the following challenges..
Addicted to Stamps Challenge: Christmas is coming. Hero Arts Holiday Challenge: Merry & Bright...Neon. ....got some new Holiday goodies to play with..yay!! 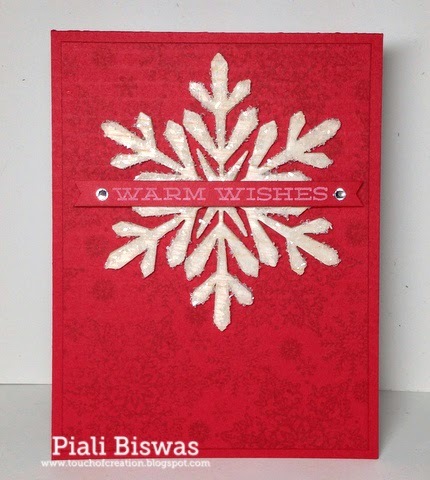 Balsa wood, Diamond Dust( my fave thing to use for holidays) and new Hero Arts Snowflake die. I'm loving tone-on-tone stamping a lot lately. 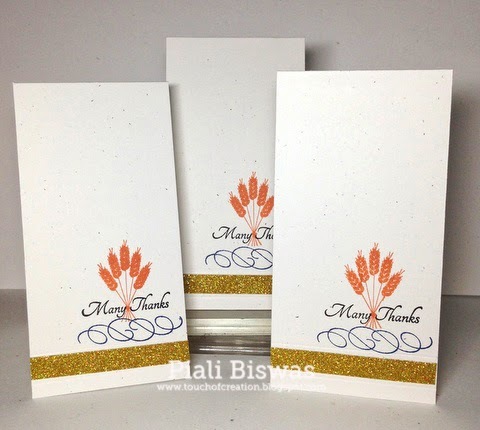 Loooooove how this card turned out...love the rich colors and the textures.. I think I'll make few more cards of this same design. I made my own snowflake embellishment ...die cutting Balsa wood using Hero Arts Snowflake die. Then added the Diamond dust (glass glitter) ...I love how it looks like really snow. 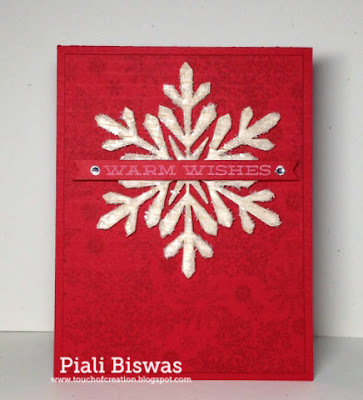 Stamped the background with various Hero Arts Snowflake stamps and HA Royal Red ink. The sentiment is also from Hero Arts. Today we're starting the week of CASual Fridays Stamps' 1st birthday celebration!!!! I absolutely love this Sentiment from Amber Waves set...very pretty!! 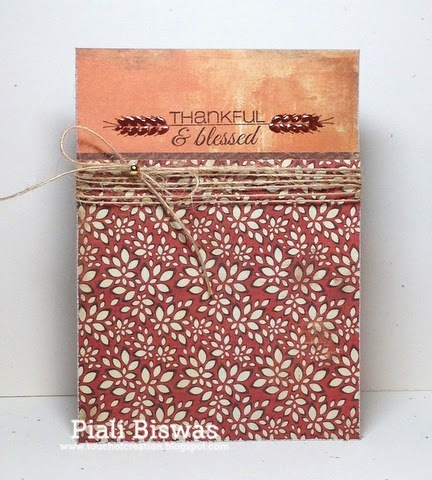 I used the Authentique papers and some May Arts jute twine for this CAS card. Simply stamped the sentiment and added some glossy accents . I have one more super fun project to share ... you have to visit CFS Blog to see it. 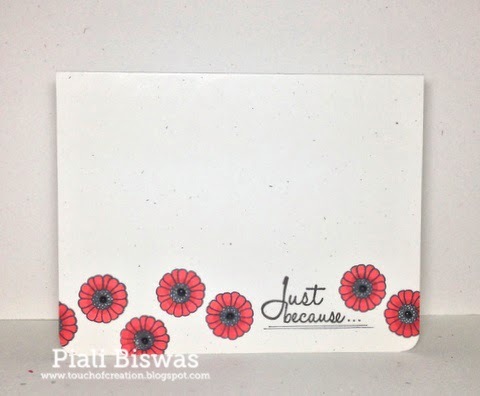 Fashionable Stamping Challenges : Make a card. Jo's Scrap Shack: Anything Goes. 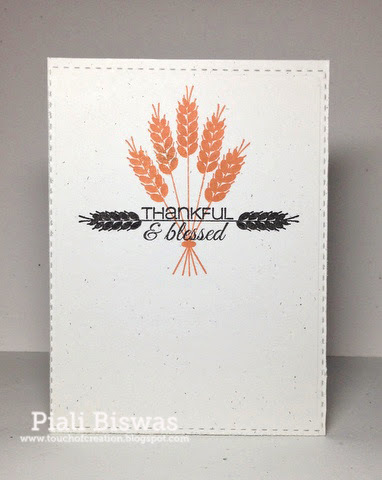 Stampin' For The Weekend : Anything Goes. Michele is giving away presents to all the CFS customers...YAY!!!! Now for my card today...I used a fun stuff for the background. Its every trendy nowadays!!!! You will see lots of cards with various use of embossing paste all around the blogland. You can find it any craft supplies store in the paint and gesso section. 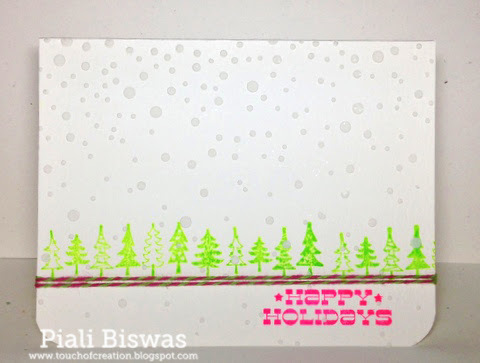 I used THIS snowflake stencil From Simon Says Stamp and embossing paste to create this fun background. It gives a great texture to the card. Love this fun image...Polar Skaters (Sku#Q4083), super cute!!! I used the glitter banner diecut from Ruby Rock-It. The sentiment sticker is from Bazzill. Cheerful Stamp Pad: Use Stencil. 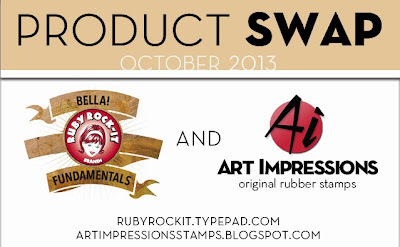 Welcome to Art Impressions- Ruby Rock-It Product Swap Bloghop!!! Its a fun product swap week...Ruby Rock-It provided Ai DT with fabulous collection kits to create with. I used THIS wedding collection papers and embellishments for my card today. Love the pretty colors and patterns of THIS collection, whole collection has a nice shimmer to it. I paper pieced outfit & the sofa of the Ai-Celeste stamp with various papers from THIS collection. The sentiment is a lovely diecut from THIS diecut pack. I also added a gold ribbon from the same collection. Addicted to Stamps and More : Coloring. Lady Anne's Stamp Challenge : Anything Goes. Piali Biswas--- you are here! Today I need your opinion about a card of mine. I colored this Ai -Five Whoots image with distress ink...it was super quick & easy!! Gotta love that! I♥♥♥ this image...cutest thing ever!!! Crafts 4 Eternity Recipe Challenge: CAS. Labels: Ai DT, art impressions stamps, cas, holidays. Wait will be over soon...all the new products will be available in CFS Store on Friday!!! Another super fun tag die set with a fabulous icon die too. 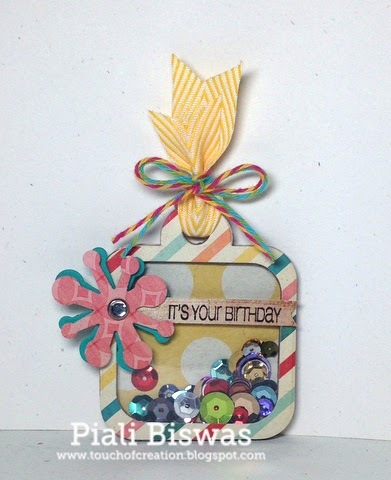 First one is card...this tag set is very versatile, you can use it for cards & scrap booking also. I used the second die from the set for my squares and the lovely motif die . The sentiment is from Amber Waves set. Simon Says Stamp: no digi, just Stamp. This die set is perfect for shaker tag...the layers make it super easy to do it. The motif die is from yesterday's Funky Round die set. The sentiment is from Woot Woot set. 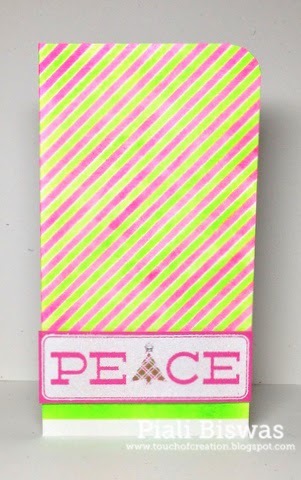 Iused some May Arts yellow chevron ribbon and lovely Timeless Twine baker's twine--- Key Lime sorbet and Pink lemonade. Inky Chicks : Use 2 different diecuts. All Crafts Challenge: Anything but a card. You know the drill....hop over to CFS Blog for your chance to win some fab CFS goodies. Hope you all are enjoying the CASual Fridays Stamps new release peeks!!! Its Day #4...today we've a fabulous die set to show.. The tag die set has two tag pieces and a fun surprise die too.. 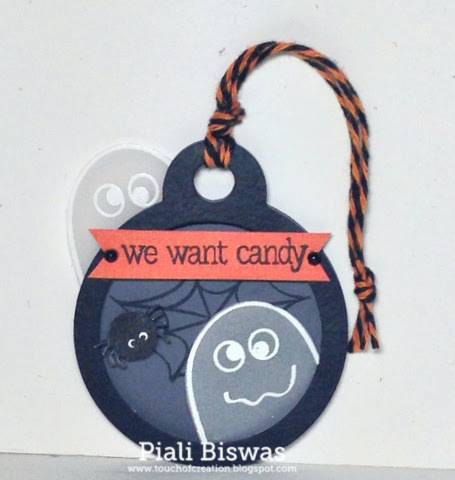 I used Spooky stamp set for this Halloween tag. Love this cute Halloween set. 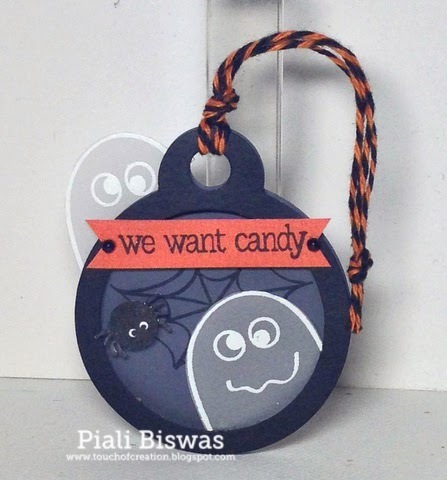 I used some fab Halloween themed Timeless Twine for this tag. 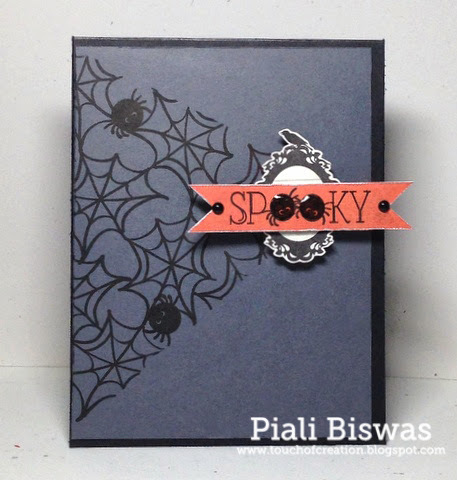 Paper Pretties Wednesday Challenge: Halloween. Simon Says Stamp: No Digi, just stamps. Don't forget to visit CFS Blog for the chance to win some CFS goodies!!! CASual Fridays Sneak Peek Day #3!! Welcome to CASual Fridays Stamps Sneak Peek DAY #3!!! I used two sizes of the 4 petals Fri-dies to cut vellum . Love these pretty flowers!! The sentiment is from CFS-Stop set. Hop over to CFS Blog for fabulous DT creations and the chance to win some CFS goodies. CASual Fridays Sneak Peek Day #2!!! Did you all like the Cute Halloween set yesterday?? There was a surprise release yesterday too.... Spooky is now available for purchase. Now its time for DAY #2. You are going to Looooooooooooove this set!!! The set is packed with fabulous sentiments and images. This set can be used beyond Thanksgiving. Come and Get It Challenges: Thanks. Come and Get It Challenges: Thanksgiving. Then I have a general thank you card set.. The set also has this beautiful Flourish image. My Time to Craft : Thank you. Now hop over to CFS Blog to see all stunning DT creations. Don't forget to leave a comment there for the chance to win!! Welcome to CASual Fridays Stamps Sneak Peek Week!!! ♥♥♥ this super cute Halloween themed stamp set...packed with fab images. Crazy 4 Challenges : Halloween. Hop over to CFS Blog for Ah-mazing eye candy and the chance to win some CFS goodies. WCMD with CASual Fridays Stamps!!! I'm back with the 2nd post of the day!!! Its Big Day,so there are lots of creations. 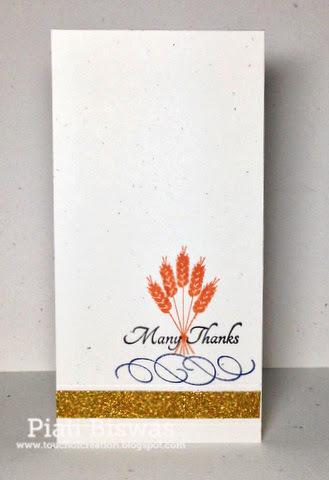 First up is a lovely thank you card for a very Dear Friend of mine. I used CFS-Lotsa Links to create a fun background with some fab Hero Arts inks. The sentiment is from CFS-Frankly set. I needed quite a few notecards...so I made this design in multiples. I used flower from CFS-Wonderful Words set and the sentiment from CFS-Loving Thoughts set. Simply colored the flowers with Copics and added a bit of Black enamel accents in the center. Now I have to make packages to mail some cards..
WCMD- Timeless Twine Linky Party!! !